I am so excited to join the Pink Paislee Design Team for a new term! I had so much fun last year, and I'm glad they let me stick around for another year! This week, the new and returning designers are in the Spotlight, showcasing their signature style. 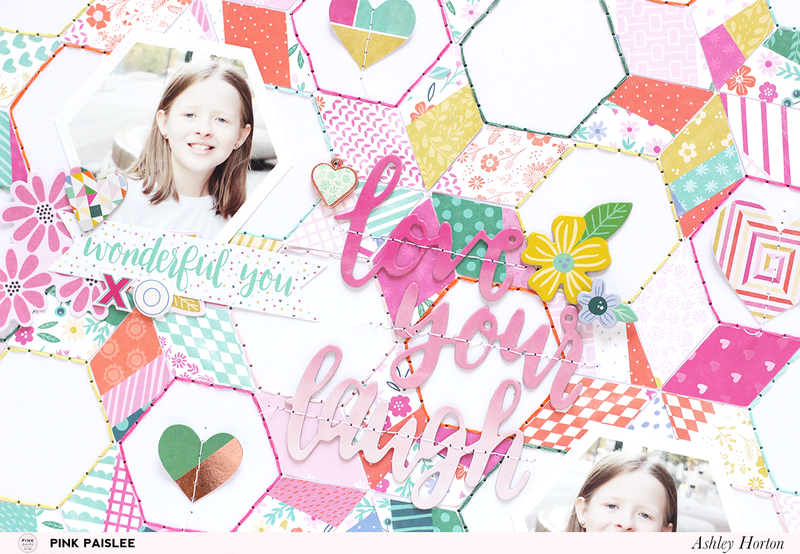 I kicked things off yesterday, with my layout using the new Oh My Heart collection by Paige Evans. I love to work with cut files, a lot of patterned papers, and hand stitching, so I decided to include all three on my layout. I wanted to use as many patterned papers from the new collection as possible, so I set up the 6 pointed star design in Silhouette Studio. Once I had it sized correctly, I repeated the diamond shape on the mat in Studio. And believe it or not, all of these colors and patterns are from only two patterned papers in the collection. Paper #12 and Paper #24 have a mix of patterns and colors from the entire collection, so it was easy to cut my diamond shapes from just these two sheets, but make it look like I used multiple papers from the collection. Once all of the diamonds were cut, I arranged them on a white cardstock background to recreate the original star shape I designed in Silhouette Studio. After all of the star shapes were completed, I used my paper piercer to poke holes along the Hexagon shapes created by the pattern. I used several embroidery floss colors that coordinated with the Oh My Heart collection to stitch around each of the shapes. I really liked that the hand stitching added more texture to the layout and helped define the hexagons on the layout. To continue the hexagon shape, I printed and trimmed my photos into hexagons also. I placed the photos on opposite sides of the layout and added a mix of embellishments around each photo to draw attention to them and help bring them out from the colorful background. I used the “Love Your Laugh” chipboard piece from the Good Life Chipboard Stickers, to create my title. The placement of the title helps connect the photos and embellishment clusters on the layout. 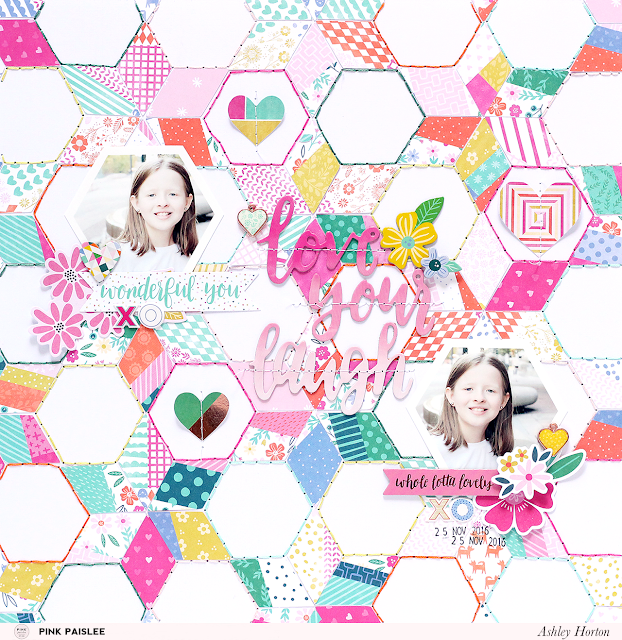 I completed the layout with a few hearts from the Ephemera pack placed in the center of some of the hexagon shapes. Make sure you stop by the Pink Paislee Blog all this week, and get to know all of the Designers that will bring you inspiration this year! Crate Paper Design Team 2017-2018! Altenew January Release Blog Hop II + Giveaway!